What do you do? I’m a [Seattle-based] singer-songwriter [and have] released over 10 studio albums and toured internationally. In 2016, I became the first employee at DistroKid, a digital music distributor. 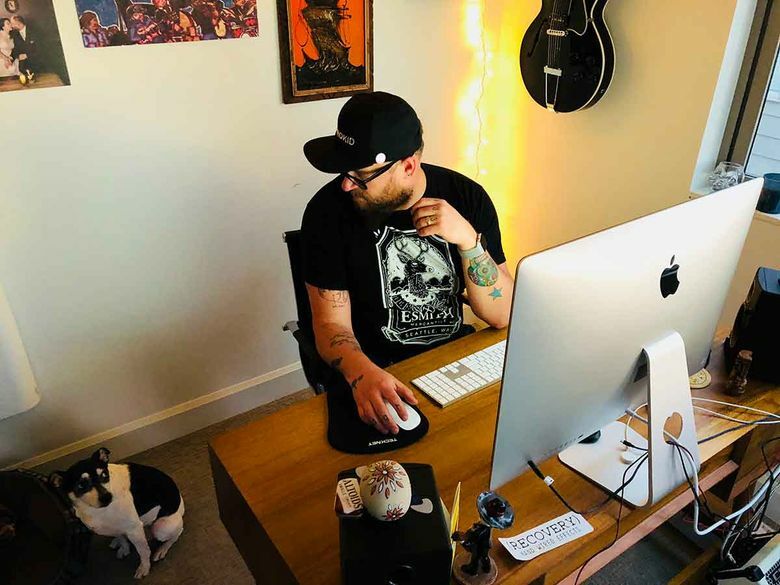 We work with over 200,000 artists and recently distributed singles by Ludacris and Will Smith, as well as some of my favorite artists like Propagandhi and Tom Waits. How did you get started in that field? I’ve been recording records since 2001. In 2015, I uploaded my album “White Mountains” to DistroKid and there was a stylization issue with one of my titles. I emailed “support,” aka the founder, Philip Kaplan. He responded and told me he’d fixed the issue and built a tool just for me (something we still give out to artists, which has been dubbed “The DGH Tool”). Mind blown. A year later, he posted about a job and we’ve been working together ever since. What’s a typical day like? I work entirely from home, so I usually roll out of bed around 6 a.m. and open my laptop. I answer a bunch of emails from priority artists and co-workers. Then I try to go to the gym. Then I’m back on for the rest of the day, and sometimes into the night. Working for a really small company that’s doing stuff that other companies do with hundreds of employees definitely means that it’s hard to switch off, and that it doesn’t really stop. What’s the best part of the job? Knowing that the artists we work with love working with us, and helping them get their music in front of people. It still blows my mind that people say, “You got your music into Spotify? How? !” It’s awesome, being part of something that makes artists feel valued and important. Also, it’s pretty rad getting to work from home, or wherever else I may be. Like, on this plane. What surprises people about what you do? I think a lot of people think that you can just call up iTunes or Spotify and ask them to put your music on their service. Artists actually need a distributor that works directly with stores, and that’s what we do. We’ve built great relationships with stores over the past few years, so we’re able to get music into stores much faster than our competitors and for a fraction of the cost.